Linear low-density polyethylene is manufactured from polyethylene. It has unique rheological or melt-flow properties. In 1960, DuPont Canada started the first production line for commercial production of linear low-density polyethylene. LLDPE is less shear sensitive than HDPE and LDPE, due to its narrower molecular weight distribution and shorter chain branching. During the shearing process, LLDPE remains more viscous and, therefore, it is harder to process than LDPE of an equivalent melt index. Rheological properties of LLDPE can be summarized as ‘soft in extension’ and ‘stiff in shear’. Linear low-density polyethylene is widely used in the manufacture of plastic bags and sheets, plastic wraps, stretch wraps, pouches, toys, covers, lids, pipelines, buckets and containers, covering of cables, and flexible tubing. Based on process type, the global linear low-density polyethylene market has been segmented into gas phase, solution phase, and slurry loop. Gas phase is the dominant process type segment of the global market. It is anticipated to expand at a rapid pace during the forecast period. The gas phase process has several advantages such as it has low initial installation costs, low temperature, and low reaction time. Based on application, the global linear low-density polyethylene market has been segmented into rotomolding, films, injection molding, and others (including metal coating, extrusion, and masterbatches). The films segment accounted for a dominant share of the global market in 2017. The segment is estimated to expand rapidly during the forecast period. The primary factor driving the films segment is high demand for LLDPE films from the flexible food packaging industry. LLDPE films are also used in the construction industry as water barriers, as these films contain some percentage of organophilic layered double hydroxides that have optimal thermal and water vapor barrier properties. Based on end-use industry, the global linear low-density polyethylene market has been divided into packaging, building & construction, automotive, electrical & electronics, agriculture, household, leisure and sports, and others. The others segment comprises electric appliances, furniture, and medical equipment. Among end-use industries, packaging is projected to be a highly lucrative segment during the forecast period. Based on region, the global linear low-density polyethylene market has been classified into North America, Europe, Asia Pacific, Middle East & Africa, and Latin America. In terms of demand, Asia Pacific held a leading share of the global linear low-density polyethylene market in 2017. The region is a major producer of linear low-density polyethylene. Middle East & Africa and North America are other significant consumers of linear low-density polyethylene. The linear low-density polyethylene market in Latin America and Europe is anticipated to expand at a sluggish to moderate pace during the forecast period. Demand for linear low-density polyethylene in these regions is estimated to rise in the next few years, owing to increasing demand for canned food products led by rising population and growing urbanization. Demand for linear low-density polyethylene is estimated to rise significantly in Middle East & Africa and Latin America in the near future. These two regions accounted for a low share of the global linear low-density polyethylene market, in terms of demand, in 2017. 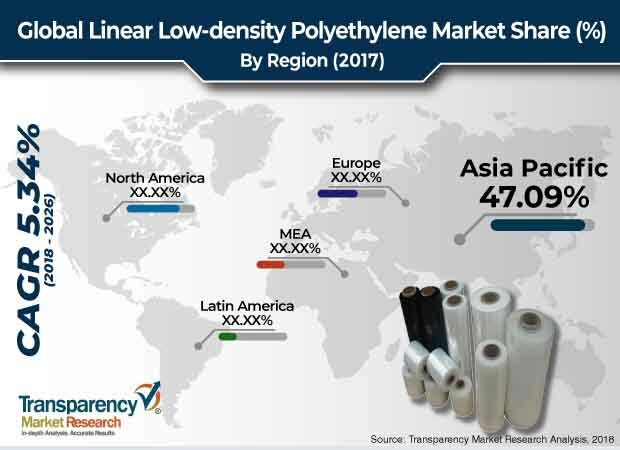 However, these regions are projected to create lucrative opportunities for the linear low-density polyethylene market during the forecast period. Key players operating in the linear low-density polyethylene market are Exxon Mobil Corporation, China Petroleum & Chemical Corporation (SINOPEC), DowDuPont, Saudi Basic Industries Corporation (SABIC), LyondellBasell Industries Holdings B.V., Formosa Plastics, INEOS GROUP HOLDINGS S.A., Sasol, Westlake Chemical Corporation, NOVA Chemicals Corporation, Reliance Industries Limited, Mitsui & Co. Borealis AG, Chevron Phillips Chemical Company LLC, and Braskem.